Police in China say they are seeking a man who allegedly threw an egg and shoes at the designer of the country's Great Firewall of web controls. Mr Fang is reviled by many Chinese web users for overseeing development of China's system of internet censorship. The computer scientist, who is Principal of Beijing University of Posts and Telecommunications, has been dubbed the Father of the Great Firewall. An officer at Luojiashan Public Security Bureau confirmed police were investigating the alleged attack, AP news agency reported. Hanunyi posted a live account of the alleged shoe-throw on his profile page, including a picture of a hand clutching an egg. "The egg missed the target. The first shoe hit the target. The second shoe was blocked by a man and a woman," he tweeted. The Great Firewall, also known as the Golden Shield Project, blocks thousands of websites, including those linked to the Dalai Lama and the banned Falun Gong spiritual movement. It also filters keyword searches for sensitive topics such as Tibet or Liu Xiaobo, the Nobel prize-winning dissident. According to some Twitter users, searches for "hanunyi" have also been blocked since the alleged attack on Mr Fang took place. 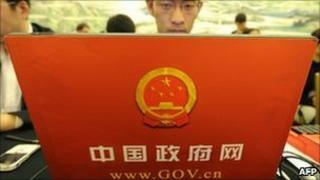 China's government has invested heavily in controlling the internet, recently setting up a body to monitor censorship: the State Internet Information Office.